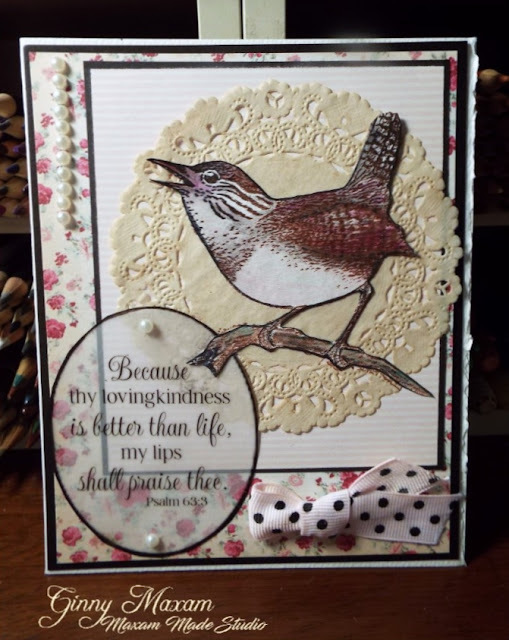 I recently created a sweet card as a DT member the Word Art Wednesday challenge blog, This is a favorite magenta stamp and I want to share the card and how I made it with you! I had to find an image to suit the verse and I immediately thought of the wren Stamp, I love it for it's pretty and versatile design. Wanting to keep it in soft shades I pulled paper from my stash in pinks and charcoal. I have this stamp in the unmounted style - I Love my vintage wood stamps but for these finely etched stamps, I really love being able to use my stamping tool. One of those crafty tools I really feel is worth the cost. Another plus, if you decide to unmount any or your wood mounted stamps, you will save storage room and ease! Save those blocks! I'm making a desktop with mine. I wanted to stamp my image on a tea-stained doily. Hmm, well that didn't work! That was a yes, you can see I mixed my ink pad stamp colors right on the stamp. I placed the bird right on top of the doily where the first impression was a dud. Thanks for stopping by, I hope you are having a great day!